DIY Videos :How to generate Free Power for the rest of your life by building a Micro Hydro Electric Power system and kiss the Grid system goodbye. 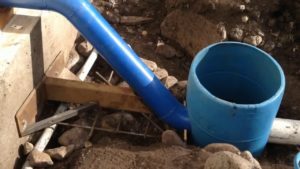 This 16 part Awesome Video series shows the overview and setup in detail of a Micro Hydro Electric Power System build for the long term from the ground up.What a hydroelectric system does is that it converts the force from flowing water into electricity. You take the kinetic energy of water flowing downhill from a stream or river and direct it onto a wheel in a turbine that converts the rotational energy to electricity. I have 2 natural springs that provide water which falls about 500 vertical feet through a mile of pipe and develops about 220 psi..Harness the power of hydropower; flowing water for clean, sustainable home free electricity 24/7 and ditch your dependency on the grid system for good. The basic components of this build are A Stream Of Flowing Water – A hydroelectric generator is only useful in a bed of flowing water,Magnets – The magnets will spin against the coils to create an electric current.Bearing – Used for the disc to spin against,Coils – The coils will spin against the bank is to create an electric current.Half-Inch PVC Pipe – The disc will be placed on the PVC pipe.5-gallon bucket,Waterline – We are using the 5-gallon bucket and waterline to create a closed system. The first step in creating your hydroelectric generator is to create the discs. There are two parts to the disc, the stator and rotator disc. The stator disk is stationary and contains the coils. The rotator disc will be spun using the water current. The magnets will spin against the coils, creating an electric current. Now that we know the process, it is time to learn how you can make a hydroelectric generator yourself. You can create these discs using templates that you can find online. Trace the amount uncovered and use them as templates to cut the discs that you will be using. Make a hole in the discs ½ inch wide, so the half-inch PVC pipe can fit through the center of them. Place the discs side-by-side and attach the fins to the turbine. Attach the turbine to the rotator disc so it spins as the turbine spins. Make sure the fins are facing into the flow of water so that they will be pushed as the water passes through them. Next, attach the coils to the stator and at the magnets to the rotator disc. When you add the magnets, alternate them with their North and South poles. Make sure each north facing magnet is next to two south facing magnets. Likewise, make sure each south facing magnet is next to two north facing magnets. Add the turbine, rotator disc, and stator disk to the PVC pipe and rest it on top of the bucket. Pour water over The fins and the turbine will begin spinning. As the turbine spins, it will begin producing current as the bank is passed across the coils. Previous articleDIY Video : How to build your own DIY off grid / grid down Solar Power Back up system from scratch .Complete Video instructional for Beginners. Next articleDIY Video: How to build a Homemade Gravity fed ,Drip Waste Oil Heater for your Garage . Really Efficient…..Good heat.